On 07 March 2019, GEO was pleased to host attendees at GEO's Netherlands Chapter Networking Social. Thank you to everyone who attended, as well as to our speakers and event sponsors for their support. Stay tuned for more information on upcoming activities in the Netherlands region. The starting point for the implementation of the NOB's PE requirement is that it is left to the professionalism of the NOB member to assess whether permanent education activities can be considered as "PE activities" within the framework of the NOB regulations. For this, the regulations mention a number of minimum requirements that permanent education must meet. The NOB has made a deliberate choice not to work with a 'points system' granting points to courses offered by commercial parties; the responsibility to assess whether PE activities satisfy the conditions lies primarily with the NOB member. 4. The education is aimed at university-educated tax advisors or other university graduates. To qualify for PE points, the education needs to be of academic level. In assessing whether this is the case, the NOB utilizes three pillars: (1) the teacher, (2) the potential educational material and (3) the audience. The education provided must therefore be aimed at an audience consisting mainly of university-educated individuals. The rationale for the latter condition (concerning the recipients of the education) is that the quality of the participants determines the quality of the education. For the courses organized, the NOB does not have a problem with a minority of non-academically educated individuals taking part, as long as the participants are predominantly academically educated. With regard to externally followed education, NOB members may reasonably assume that the condition of an 'academic audience' is met when both the teacher and the educational material are of academic level, unless it is evident in advance that there is no predominantly academically-educated audience. These conditions apply to PE points granted for both receiving and giving education. Preparation for receiving education is not regarded as permanent education. Preparation for giving education can qualify for PE points, but may not exceed the time spent on giving the education itself. In giving education, there should be no repetition to such a point that it invalidates the educational aspect. It is in principle up to the discretion of the NOB member to determine whether this is the case. For a course that is given multiple times (per annum), the conclusion should probably be that the educational aspect for teachers lapses for the second and subsequent courses. However, there may be circumstances in which this is not the case, for example if the teacher has to amend the course radically because of altered legislation or developments in case law. In addition to tax technical education, PE points may also be granted for education related to adjacent subjects that contribute to the development and / or deepening of technical knowledge. On March 7, the Dutch GEO Chapter provided all Dutch issuers of share plans with a last and final chance to win a free ticket for the Global Meeting in Amsterdam in April! These drinks were kindly sponsored by PwC Reward, and were therefore free of charge. As always, they were held at our favourite location, Grand Café Amstelhoeck (Amstel 1, Amsterdam). Of course, all GEO members (providers, issuers, academics and government representatives) were more than welcome to attend. GEO's Dutch Chapter celebrated the return from the summer holidays (or, as the French call it: La Rentrée) by organising refreshing networking drinks for all GEO members and interested parties. These drinks were kindly sponsored by Captin Equity Management Services, and were therefore free of charge. As always, they were held at our favourite location, Grand Café Amstelhoeck (Amstel 1, Amsterdam). Among the esteemed speakers that will present at this meeting we have Carine Schneider, who is a Partner at Nua Group LLC and was named by the Silicon Valley Business Journal as one of the 100 Influential Women in Silicon Valley in 2017. Ms. Schneider has vast experience in developing total rewards, in particular concerning share-based compensation in the start-up environment for new high-tech companies, of which many are based in Silicon Valley. GEO's Dutch Chapter started off 2018 in the spirit of togetherness, with our annual New Year's networking drinks. These drinks were graciously sponsored by the Witscraft tax and HR consulting firm, and took place at our dedicated location, Grand Café Amstelhoeck. A select, international group of speakers was lined up for this in-depth educational meeting. Wanne Pemmelaar of Allen & Overy spoke about exponential change, the value of data as a strategic asset, and data compliance laws as a regulating mechanism of such value. Anne-Sophie Blouin of Deloitte then detailed the new Shareholders' Rights Directive as issued by the EU, and Folkert Hendrikse of PwC closed off by elaborating on the new EU General Data Protection Regulation. As a special guest we will have the Amsterdam Municipality’s alderman responsible for Brexit, Mrs. Kajsa Ollongren, as a speaker. Kajsa will discuss the policy of the city of Amsterdam in connection with Brexit. Also, Mr. Matthew Findley will offer his points of view from a UK perspective. Matthew is a partner employee benefits and executive compensation with Norton Rose Fulbright LLP in London. Finally, we will have representatives of Dutch multinationals affected by Brexit, who will detail their strategies of dealing with the consequences in point. Motivational speakers Joanika Ring and Erwin Boersma spoke about non-duality and the spirit of all or nothing at all: certainly an attitude required of any tough sailor! Both speakers were sponsored by MonIdee. A Nautical programme offered attendees the opportunity to sail in “Valk” sailing boats or even to paddle on Stand Up Paddle (SUP) boards! The event ended with a complimentary cruise through the canals of Amsterdam in luxury sloops made available by i.a. ReQurance. This event was graciously sponsored by Equatex plan administrations. Lion’s den or centre of excellence? Regulatory and corporate governance updates at the Dutch Tax Authorities! In recent years, the regulations surrounding compensation (paid both in cash and in equity) have been getting ever stricter. From a wage and income tax perspective, we have seen the reintroduction of vigorous wage tax audits, focusing on the spot-check (“steekproef”) methodology set out in the tax authorities’ new CAB guidelines. Also, under the Act on the Deregulation of Labour Relation Reviews (“Wet DBA”), the well-known Declaration of Labour Relation (“VAR”) will be replaced by model contracts. Finally, on the “comply or explain” side of the law, we have recently seen a new draft of the Dutch corporate governance code, which contains a number of interesting provisions concerning equity-based pay and Board Members. 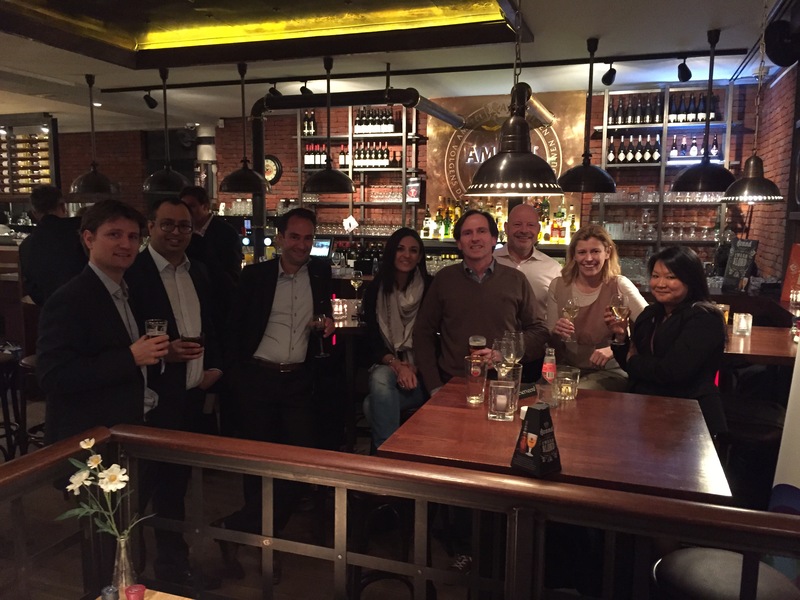 GEO's Netherlands Chapter gathered at the Grand Cafe Amstelhoeck for an informal networking reception to mark Christmas 2015. Attendee met share plan peers from a broad range of companies alongside some familiar faces. This happy occasion, sponsored by Solium, took place on Tuesday, 15 December 2015, as of 17:00 in the Grand Café Amstelhoeck. A wide array of snacks and drinks were available there, for both issuers and providers working with equity compensation plans in The Netherlands. To allocate or not to allocate, that is the question! The next question is how? During the meeting, we will explore the ways how companies allocate awards to their internationally mobile employees from the grant allocation process to the allocation of the taxable benefit to ensure the payroll process runs smoothly. More details about the topics and speakers to follow soon but please already save this date in your calendars. 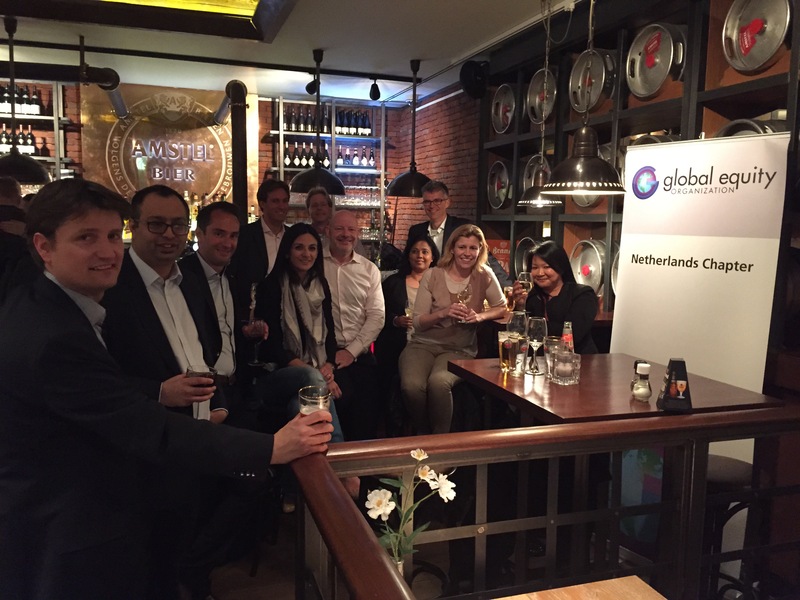 GEO's Netherlands Chapter gathered at the Grand Cafe Amstelhoeck for an informal networking reception to mark the start of Summer 2015, to celebrate winning the 2015 Chapter of the year award and to share experience of the GEO's 16th ANNUAL CONFERENCE in London last April. This happy occasion, sponsored by PwC, took place on Friday, 26 June 2015, as of 17:00 in the Grand Café Amstelhoeck. A wide array of snacks and drinks were available there, for both issuers and providers working with equity compensation plans in The Netherlands. The Netherlands Chapter hosted an informal networking reception to mark the return of GEO's 16th ANNUAL CONFERENCE to London in April 2015. Attendees met share plan peers from a broad range of companies alongside some familiar faces. This happy occasion took place on Friday, 13 March 2015, in the Grand Café Amstelhoeck. A wide array of snacks and drinks were served, for both issuers and providers working with equity compensation plans in The Netherlands. This informal Dutch Issuer-only drinks reception gave attendees an opportunity to network among peers and to meet with the GEO Executive Director, Danyle Anderson. In addition, we gave you the opportunity to openly discuss GEO matters that are important to you. We loved meeting with attendees and heard your ideas, especially in the run up to the 16th Annual GEO Conference in London in April. In the Dutch share plan market, we currently see many issuing companies changing from one plan administrator to another. Some of these changes are necessitated by recent market developments, while others result from a change in business needs from the issuer's side. But whatever the reason for the current market shift may be, it certainly provides a unique opportunity to share with you the lessons learned by companies who have recently changed plan administrators or even have just gone through the process of selecting a new administration provider for the first time. To facilitate this, four issuing companies who recently experienced such a process of change agreed to provide their valuable insights on the subject. All four of these companies were accompanied by their respective plan administrators, so that the topic was addressed from both the issuer's and the provider's point of view. Practically, this was achieved by having two panel discussions, i.e. an issuer panel and a provider panel. In line with the Dutch Chapter’s new initiative to realize more opportunities for our members to network and exchange ideas in an informal setting, the GEO Netherlands Chapter organized its Summer Drinks in Amsterdam. This happy occasion took place on Thursday 3 July, 2014, in the Grand Café Amstelhoeck. A wide array of snacks and drinks were available there, for both issuers and providers working with equity compensation plans in The Netherlands. This was the second informal session of the year, and it precedes a more formal session to be hosted in September of 2014, which will focus on the data migration issues many companies encounter when changing equity administration providers. On 21 March 2014, the Dutch GEO chapter celebrated the beginning of Spring at the Grand Café Amstelhoeck in Amsterdam. A wide array of snacks and drinks were available for both issuers and providers working with equity compensation plans in The Netherlands. This opportunity provided all Dutch GEO chapter members with an excellent opportunity to network, exchange new ideas and make plans for the global May Conference in Miami, USA. Following the success and the enthusiastic responses received for this topic during the GEO Irish Chapter meeting in January 2013, we invited esteemed experts to again share their insights for the GEO Netherlands Chapter. The presentations were followed by a Networking Reception, including a buffet. Dennis Paalman, SVP Compensation & Benefits, Royal Ahold, talked about how Royal Ahold reinvented itself over the last decade, moving from a post crisis, via credibility into a responsible growth mode and the role (equity based) compensation played in this journey. Marc Muntermann, Head of Global Share Programs, Siemens AG, discussed the Siemens Equity Strategy. He shared how to establish an Equity Culture as a fundamental part of the Company Culture and take a closer look at plan design, communication strategy and measurement of the overall success.